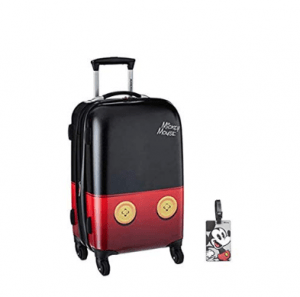 American Tourister Disney is a 21-inch cabin size suitcase with a sleek and modern design and a hardshell exterior of the lightweight and sturdy ABS plastic. It is offered with the colorful graphics of Mickey Mouse Pants (with or without ID tag), Mickey and Minnie Romance, Minnie Lux Dots, Minnie Mouse Red Bow (with or without ID), and Snow White. And they are ideal for both the boys and the girls. The ID tags cost about $3.5 extra and each pattern costs different despite having exactly the same materials and design. The average rating by 122 customers is 4.7 out of 5 stars on the day of this product review, which we think is great. 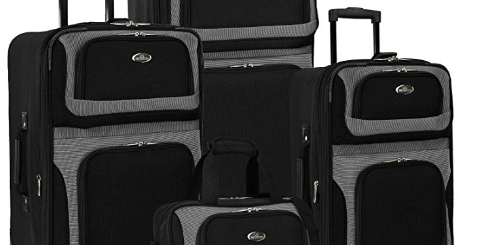 The price is not low for a single cabin bag but you’re paying for Samsonite American Tourister quality, design, functionality and long warranty. They have the solid single spinner wheels that rotate in all directions easily and smoothly by holding the American Tourister branded push-button locking mono tube pull-handle. It is very easy to maneuver even by the 7-8 yr old kids- it moves that easily. A solid strap will keep the tag (with an ID insert at the rear) stay put when you’re on the move. 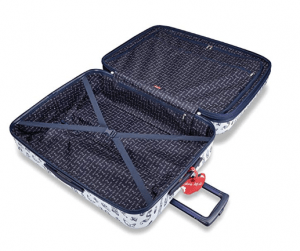 The American Tourister cabin bag weighs 6.8 pounds and measures 21 x 14.75 x 9.5 inches including the wheels and the handles, making it perfectly suitable on most domestic and overseas flights. The Disney 21-inch carry-on bag offers plenty of storage space and is also expandable through the middle zipper when you need to. It looks very cute, with a similar design to the adult version by American Tourister. It is built very sturdy and durable and shall hold up well over many travels over time. Luggage handlers at the airports often tend to treat your bags badly, throwing them around. And the good quality hard side suitcases will have a better chance of survival than soft side. It won’t fit underneath your airline seat but will fit in the overhead locker above your seat on most planes. With the Mickey Mouse patterns this cabin bag is designed for kids of all ages. There is also no reason why adults can’t use it. The size is great for weekend or longer trips, depending on how much stuff you’ll need or want to take with you. Your child can push or pull it behind them easily and will be OK if you do the lifting by holding the top grab handle if it is a bit heavy. 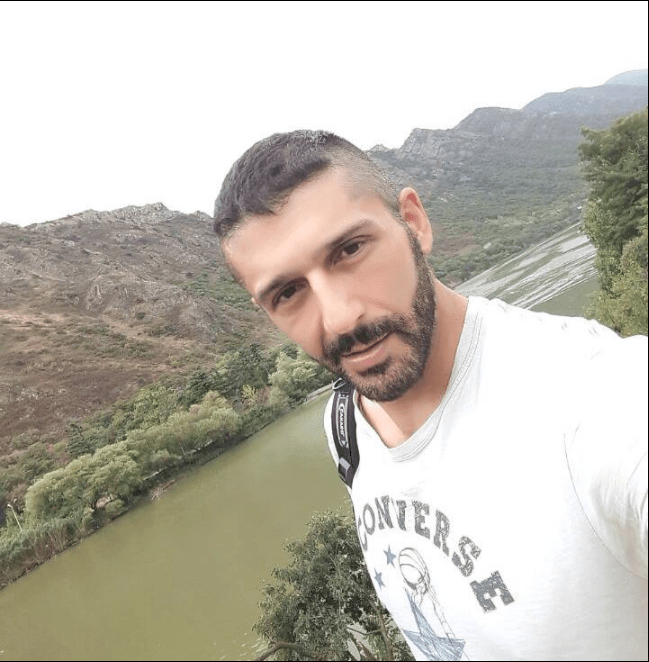 There is full polyester lining inside with elastic crisscross straps on one side and a zip around divider on the other side for creating two sections. To sum up, they are easy on the eyes with the fun graphics, great Samsonite build quality, ergonomic design, have decent interior space and pockets for good organization at a fair price.